Home » 08-09 Offseason » A New Catcher? After another late-season collapse, we would think the Mets would be hell-bent on fortifying the bullpen, figuring out what to do with the second base issue, deciding on who to bring back and/or acquire for the starting rotation, whether they’ll pick up the option on Carlos Delgado, and who the 2009 left fielder might be. And that’s the short list of decisions. That said, you would think that the catching position is one that is more or less set, particularly considering Brian Schneider’s strong second half. 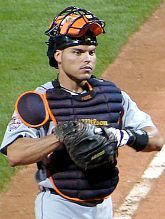 Yet, a day after the regular season ended, it is rumored that Pudge Rodriguez — who will be be a free-agent this winter — contacted the Mets and is very interested in leading the club into the postseason next year. Loyal readers of MetsToday know I’m a huge fan of Pudge, and though in hindsight the Yankees trade for him didn’t pan out as well as they’d hoped, I think he’s a great fit for the leaderless Mets. Yes, Pudge is only a shell of his former self. Yes, he’s yet another old player who is bound to break down — and don’t we want to get away from the Moises Alou types? Obvious points. However, the Mets are DESPERATE to change the culture in the clubhouse. Injecting Ivan Rodriguez into that clubhouse is a great first step. It’s not the complete answer, but it’s a start. The guy has been a top player and a winning player his entire career — winning as in the way he approaches the game and conducts himself. He is a leader as an example, vocally, on the field and off. And he is one who has led teams into the postseason in the past. He owns championship rings and he would command instant respect. How many 2008 Mets can say that? Further, how many players with Pudge’s credentials will be easily acquired in the offseason? These throwback type of leaders are going the way of the dinosaur. If the Mets were to sign Pudge, I believe it makes sense to keep around both Brian Schneider and Ramon Castro, because he’s not going to catch every day and there is a chance he’ll be on the DL at some point. The Mets should try to keep three backstops anyway, and for this to work, Pudge (or Castro) would have to be comfortable with a second position. Pudge played a handful of games at 1B in 2006, and surely can play adequately there again. He may be athletic enough to handle left field as well. Castro? Not so athletic, but who knows. Schneider, obviously, doesn’t hit enough to experiment with, but I’d keep him around. Schneider, in addition to his strong defense, also is a positive clubhouse guy and potential leader. I can easily envision a platoon situation where all three players contribute throughout a 162-game season, and all remain fresh. Bringing in Pudge, in my mind, would be a good start to changing the personality of this team, while adding a little punch to the lineup. What do you think? I have to disagree on Pudge, Joe. He didn’t help the Yankees this year (although I suppose he may have come over too late), and I don’t think whatever “leadership and/or experience” he may bring to the team is worth the weight of carrying him. C’mon Deb, you gotta give us more than that. What’s the “weight” you’re referrring to? The guy hit .295 through the 82 games before the trade, and is a career .300 hitter. Even if he drops off, he’s still at least 25 points better than Schneider — and equal or better defensively. Having the two of them split the season should enable both to hit better than if either played regularly. And he keeps himself in unbelievable shape, so I’d count on him to get through a season before Castro — who is not getting any skinnier, younger, or more dedicated. Don’t you think his leadership and winning qualities would be valuable to a team that hasn’t been able to close the deal two years in a row? There aren’t many free agents out there who WANT TO play in NYC and have World Series rings. Thanks for the love, and right back atcha! Personally, I’d love to go get pudge if we can move castro for something and if pudge doesn’t take up much of our financial wiggle room. When he’s on the field, castro has been the best catcher we have…but he is such a huge injury risk and always seems to be down at the same time as our number 1 guy. I just think we need to move on from having these types of players, and we should definately be able to get something useful for castro on a one year 2.5 million dollar deal. I’d be very happy going into the season with pudge and schnieder as our catchers. The only reason I would say no is if he wants a large sum of money, in which case I’d just live with what we have and focus on pitching. I don’t think I’d carry 3 catchers, I’d rather just hide a vet in buffalo and call on him as needed. I’m not thrilled with Schneider and Castro, either, Joe, but I don’t think Pudge is the answer. I think Schmidtxc has a point about the money he may want, and aside from that, I’m not sure Pudge’s leadership qualities are exactly what we are looking for. Plus, as you probably know, I’m a fan of giving Wright and Reyes the clubhouse next year and seeing if they can, or will, provide the needed leadership. Throwing Pudge into that mix may not be beneficial in the long run. And I am thinking long run here, Joe, not short run, which is the only benefit Pudge may provide, due to his age. Sorry, I’m not loving the idea. Look, I won’t puke in my cornflakes were it to happen, but frankly, it’s the least of my worries with this team right now. I vote no. Joe, you practically summed it up best by implying that the Mets have too much other stuff to worry about this offseason as far as filling out their roster is concerned than to go and shuffle up the cards at catcher again. But my reasons for not pursuing Pudge go beyond that. First of all, Pudge will be 37 next season. For the first time since 2002, he failed to compile 400 atbats this year. Also, for the first time since 1992 he failed to hit 10 home runs. To me, he’s approaching that time of his career when age is going to make him more a liability than an asset. Yes, I know Delgado will also be 37 next season and I’m all for re-signing him, but Pudge didn’t hit no 38 home runs this past season either, did he? Pudge is also likely going to demand $6-million per year or more on the open market, which is a lot of money to give a guy to be a platoon catcher. Not to mention he’s also going to demand draft picks to sign. He’s a notoriously poor OBP guy with diminishing skills, both offensively and defensively. For example, he’s known best for his defensive prowess, but both he and Schneider threw out 32% of base stealers this season. So he really presents the Mets with no solid on-field upgrade anywhere. I have no concrete evidence, but I’ve also heard he’s very poor at calling a game. I think my main mantra is, if it’s not broke why fix it? I think Schneider did a very serviceable job as our #8 hitter, was an above average defensive catcher, and did a great job getting maximum output from the starting rotation. He developed a very good rapport with guys like Johan, Pelfrey, and Maine, all of whom figure to play big parts in 2009. Bringing in Pudge changes that dynamic and forces the pitchers to reacquaint themselves with yet another brand new catcher. No way do I plan 2009 carrying 3 catchers on the roster. That’s as insane as batting the pitcher 8th. I realize guys like Beltran, Wright, and Reyes hardly ever need or get days off, but one of your arguments during the season, Joe, was that Jerry/Willie didn’t rest his regulars enough – but by carrying 3 catchers you’re assuring that those 3, and probably more, NEVER get an off day because of the short-handed bench. The only thing Pudge has going in his favor is his experience and leadership values. But look where it got Detroit and the Yankees this season. No where. What makes the Mets any different? I also keep hearing that the Mets need to turn the page and allow Wright and Reyes to take full control of this team without any other strong personalities getting in the way. Wouldn’t adding Pudge further delay the leadership development of the younger Mets? If Castro was a free agent this winter, I could understand going after Pudge hard. But as it is, we already have 2 catchers who are dirt cheap and have proven to be reliable contributors on a winning team. Why feel the need to spend more money and sacrifice more draft picks supposedly upgrading at a position we’re already set at? To me it makes absolutely no sense. Deb, this team is desperate for someone with some chutzpah, and although I love Jose Reyes, he’s never going to be a guy who will lead a team. Not like a Pete Rose or a Jason Varitek or a Paul O’Neill, for example. It won’t be David Wright’s team until Delgado leaves — and I don’t see Pudge as hurting Wright’s potential as a leader. Rather, I see Pudge as a fantastic influence who can enable D-Wright. When Delgado was jogging down the 1B line in 2007 and early 2008, D-Wright was doing the same thing. Wright needs someone to teach him how to be a leader. As I stated in the post, Pudge would be a START, not the end-all be-all. As a part-time player, he wouldn’t have the power to be the #1 guy in the clubhouse, but just having him around the team would be a benefit. I look at him in the same way the Yankees used to add winning ballplayers to their bench in the late 1990s early 2000s — guys like Tim Raines, Chili Davis, Joe Girardi, Robin Ventura, etc. The idea that you can bring in one guy, as has been suggested by Gary/Keith/Ron and Francesa, among others, is nice in theory but it’s tough to find that one guy. So what you do is try to collect several “winners” who can help change the culture and personality of the team. Pudge can do that and also make a legit on-field contribution. What’s this about “long run”, anyway? Do you think the Mets should dump all the elder statesmen and build for 2011? If so, I don’t think it’s a bad idea, but then we’re opening a whole new can of worms. We absolutely need a new catcher but NOT Pudge. First, there’s no “going after Pudge hard”. Pudge supposedly wants to play for the Mets. If that’s true, then he’ll come at a discount. Second, Pudge’s leadership qualities seemed to work out just fine with the ’03 Marlins and ’06 Tigers. In fact many considered him integral parts of those teams, in as far as leadership. Third, I hear you on the injury possibility and the diminished skills. But guess what? Schneider’s not getting any younger, either, and that’s why I think it’s a GREAT idea to turn them BOTH into a platoon to get the most out of them. And despite Pudge’s age, he manages to stay healthy at a better rate than the younger Castro. Which brings me to my next point: it IS broken. I don’t want to see Robinson Cancel on the roster next year, but he will be if Castro is the backup and has his monthly stint on the DL. And did you read the part of the article that says Pudge or Castro would have to play another position for the thing to work? I think that addresses your 3-catcher argument — someone would have to be a C/OF/1B guy, which isn’t entirely out of the question. Wright and Reyes are NOT the answer when it comes to leadership. Leaders are not made, they’re born. Wright will eventually be a leader, but not the type who takes over a team — if he had that kind of personality, he already would have done it. He’s a leader like Derek Jeter — a guy who needs other leaders around him, and one day, after 10 years and a few rings, others will look to. Reyes, as much as I love him, I wouldn’t expect to lead a kindergarten class. The pitchers, by the way, will have to reacquaint to a new catcher no matter what — unless we think that most of the pitching staff will return in ’09. Other than Pelf, Santana, and hopefully Maine, who else is guaranteed to be back? What I’m seeing is nothing solid that is linking Pudge to “wanting” to be a Met. He “supposedly” is interested. It’s “rumored” he is pushing to be a Met. But truth be told, there are no quotes from Pudge that I can find that tell me he’s dying to play in Queens in 2009. So I’m not sure where all this conjecture is coming from, aside from a small blurb from 2004. Ultimately, it’s going to come down to money for Pudge, just like everyone else, and perhaps the team that is willing to give him A) the best shot to win, and B) the best chance to start. The Mets have the money, but the question is, with holes in LF, 2B, starting pitching, relief pitching, and potentially 1B to fill, will they want to spend more money on “upgrading” their catching department? The Mets should offer Pudge a good chance to win, but to start? Maybe 90 games if he’s lucky, and that’s even if he’s willing to learn a new position. Outside of 7 games at 1B and one game at 2B in 2006, Pudge hasn’t played any other position not requiring a mask. What makes you think A) he’s willing to move out from behind the plate, or B) he can handle a brand new position? To me, this seems more pipedream than reality. And even if there does exist a quote from Pudge that was made within the last week or so that has him wishing to be a Met, what makes you think he’s being honest? From a player’s standpoint, it makes sense to link yourself to negotiations with the Mets to drive up your price. Everyone in baseball knows the Mets have money, and might think Omar will be a big spender to avoid a third straight postseason whiff. If Pudge or his agent tell a team the Mets are involved in talks with him, it forces the team to play the bidding game, even if the Mets have no interest in Pudge at all. So, what I’m saying is, don’t think for a second Pudge actually wants to be a Met until you see him donning a Mets jersey being introduced to the media. I’m all about acquiring guys with leadership values, but they need to fit the puzzle. And with the way the roster is currently constructed, Pudge is a round peg and the Mets are a square hole. Why not scope the landscape for a free agent with leadership values who plays a position we have a vacancy at? Orlando Hudson, Greg Maddux, Derek Lowe, Jim Edmonds, Mike Mussina, Manny Ramirez, Luis Gonzalez…all free agents, all play positions the Mets have holes at, and all have good leadership skills. And all are coming off pretty good years, unlike Pudge. Why not one of them?? I heard from one inside source and an external source (the link in the post) that both confirmed Pudge calling the Mets. Jon Heyman recently wrote that the Mets are looking to “upgrade” at the position. I think it’s a fine idea to consider it, because Schneider is no spring chicken and Castro is far from a fit athlete. And what’s the fun of the winter without uncovering rumors and debating them? I’m not sure why Pudge is a square peg when the Mets would benefit from putting Schneider into a platoon role. And who said we wouldn’t look at all those other players and positions you mention? Did you read the entire post? I thought I made clear that Pudge would be a START toward changing the team. The Mets need a significant overhaul, and will have to go through with one whether they like it or not because of the potential free agents and holes left due to injuries and underperformance. Trust me we’ll be discussing every single option and then some between now and February. By the way, how is Pudge not coming off a “pretty good year”? He hit .295 for the Tigers in 82 games, threw out 32% of runners and led all AL catchers in assists … I’d take that combined with another 80-100 games from Schneider next year.